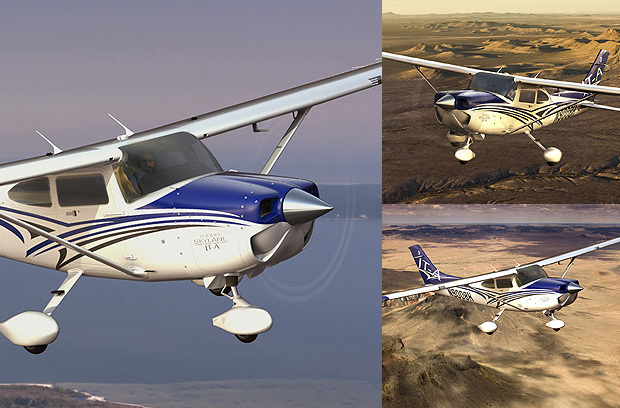 Sport Pilot and Private Pilot Members can now access four Cessna-162 LSA Light Sport Aircraft at the Palo Alto Airport. A great cabin width (over 44 inches wide; about 4 to 5 inches wider than a Cessna Skyhawk plane). Moving Maps to provide instant position awareness, even when flying above the clouds. Weather maps that can provide near real-time radar images of moving rain and thunderstorm locations. And satellite views of cloud coverage. Display of real time wind directions and magnitudes, icing levels, and more. Terrain Proximity displays, with color-coded obstacle maps, and a voice alert, for extra safety. Balancing fun and fuel this plane uses only about 5 to 6 gallons per hour. You will have a smile on your face when you get to zoom this plane on some cross country flights across the Western US. Where do you want to fly today? Let’s fly places! This is a new high-performance 4-seat aircraft. It has a roomy interior and a 230 HP engine and a variable pitch propeller for improved climb performance. It offers a modern Glass Cockpit with local Traffic Information (TIS), as well as En-route (TAS) Traffic information. speeds with larger load capacity, compared to the C-172 Skyhawk. And it is suitable for trips to airports at a higher density altitude, and can be used for flying in ‘VFR’ (visual flight rules) as well as in ‘IFR’ (instrument flying rules) conditions. Maecenas augue odio, vulputate eget lorem vel, posuere eleifend lorem. Donec convallis tristique dui, ut ultrices felis sollicitudin sit amet. Donec vulputate odio eu nibh aliquam sagittis. Etiam consequat aliquet magna. Nullam nec lacus aliquam, vulputate nisl non, feugiat arcu. Nam ultrices a velit in ultrices. Aliquam lacus enim, pharetra a ultrices sed, fermentum a turpis. Cras a diam vel magna vestibulum adipiscing. Curabitur in justo in est sagittis iaculis. Pellentesque pellentesque erat id odio posuere, et molestie dolor sollicitudin. ©2019 Stanford Flying Club. All Rights Reserved.